The tour will start in San Jose at the Fairfield Inn and Suites, 1755 North First Street. This hotel serves the San Jose International Airport and is ideal for our out of town guests who intend to fly in. If you have purchased bus transportation during registration, the busses will leave this hotel at 8:00 AM on Saturday June 15 for our first camp at Lake Tahoe. 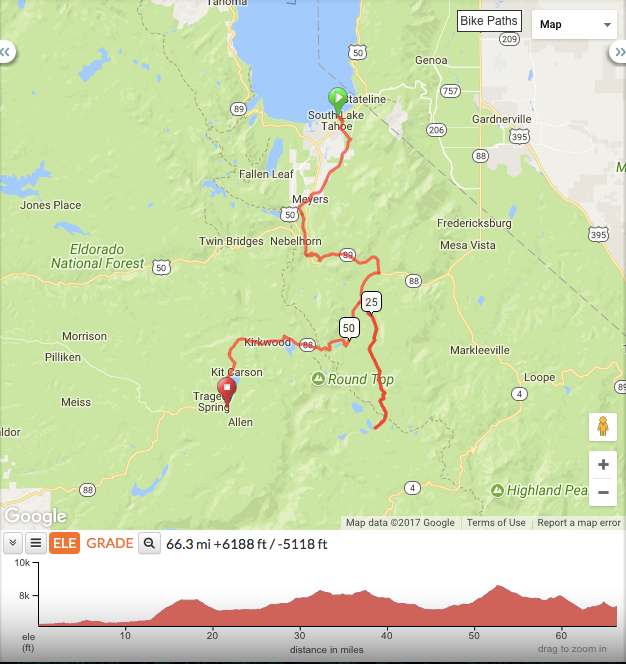 Those not Leaving from San Jose, or providing other transportation to Lake Tahoe may meet the tour Saturday in Lake Tahoe. Paid long term parking may be available for Fairfield Inn and Suites hotel guests: $5.00 per night. Purchase at check in. Paid long term parking available for non hotel guests: $10.00 per night. Important parking note: Long term parking at the hotel will be limited. Therefore we strongly encourage our local guests to find a way to be dropped off at the hotel if at all possible. Day 1 is our chance to do some real High Sierra climbing over two mountain passes. Starting from the shores of Lake Tahoe at 6300’ the route follows Pioneer Trail to a picturesque climb on a narrow quiet mountain road up Luther Pass summiting at 7740’. Your legs won’t complain about the 10% grades because your eyes will be entranced by unbelievable stunning scenery surrounding you. After a decent down the other side of Luther Pass you can explore an optional journey along another seldom traveled road to Blue Lakes. After a short rest at the lakes we tackle the bigger climb over Carson Pass summiting at 8652’ with a few more 10% grades towards what seems the top of the world. Descending the other side, we pass Caples Lake and Kirkwood Ski Resort before summiting two more smaller climbs to get us to camp at Silver Lake. 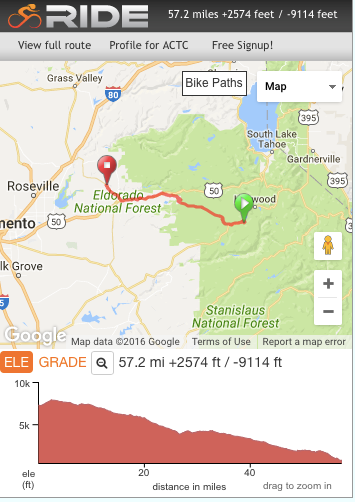 Today you can be proud of 6200’ of climbing with the lake option or 4500’ without. Day 2 is our reward for conquering the sierra’s but begins with a 700’ climb out of camp to put us on a mostly downhill leisurely cruise on quiet mountain backroads. Today we climb 2700’ but descend more than 9200’ arriving at the South Fork of the American River. The route travels along the Mormon Emigrant Trail, Pony Express Trail, Kit Carson Road, and the El Dorado Trail. This is the “Ponderosa” of the 60's. The route leaves the El Dorado Trail to follow Coloma Road through old town Placerville providing many snacking opportunities before continuing down to the river. Camp is a stone's throw from the river at the American River Resort where screams of white water rafters can be heard in the afternoon as they pass by. The gold discovery site of Sutter's Mill is a short walk or ride from the camp, as are several local shops and restaurants. Be on the look-out for gold nuggets if you go. Day 3 begins with two gentle 600’ climbs followed by downhill and flat terrain the rest of the day. 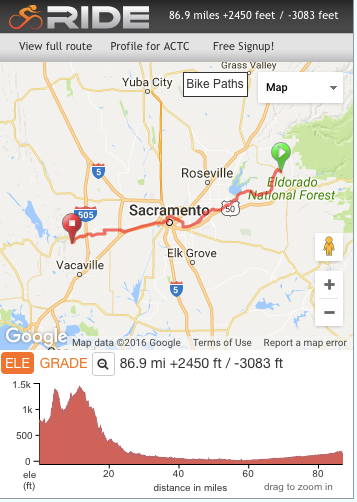 Our longest day at 85 miles traverses the Central Valley of California passing though Folsom, Sacramento, Davis and Winters, all great places to test the local cuisine or to find that old time soda fountain. The route meanders along the American river on the Jedediah Smith Memorial Bike Trail. Smith is credited with discovering the South Pass of the continental divide establishing the best route for the Oregon Trail. Dinner is served at a Lake Solano Park picnic area opposite our campground entrance. Local peacocks will entertain you but may lose their appeal as they continue their chorus of cries into the night so don’t forget to pack ear plugs. Day 4 continues west via Hwy 128 and crosses the tour’s half way point. 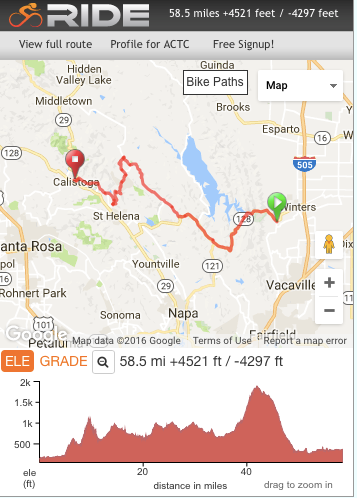 It climbs past Monticello Dam then up and over "Cardiac Hill" in Napa County. “Cardiac Hill” was coined by Iron Man Dave Scott as the best road in the area to get a good cardiac work out. Rest stop 1 is at Turtle Rock Bar and Grill, well worth a peek inside. 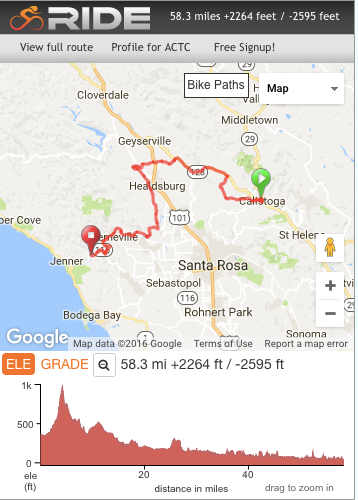 Head north through vineyards and forest into Pope Valley and a shaded 4 mile 1000’ climb up Ink Grade Rd. Luckily, rest stop 2 at the Clif Family Farm is half way to the top. Your efforts will be rewarded with a magnificent descent into the Napa Valley, one of the most scenic of the tour, followed by a short 6.5 mile roll into camp along Silverado Trail. Camp is at Napa County Fairgrounds but Calistoga provides a great opportunity for a mid-week hotel splurge! Dinner tonight is on your own at one of the many great restaurants located downtown. Day 5 is a tour through classic California Wine Country with winery rest stops for some local tasting. Sag vans will carry your purchases to camp to enjoy with your fellow riders after a day in the saddle. 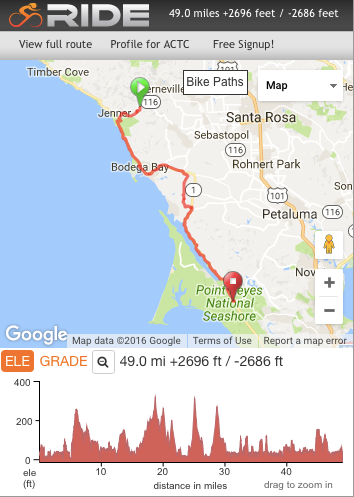 Today is mostly rolling terrain with no major climbs to give your legs a rest as you travel along the Russian River dotted with small towns. Slip back into the 70’s as you roll through Guerneville and Monte Rio to enjoy a leisurely lunch or simply relax beside the river before taking a side trip through Armstrong Redwoods to ride among the majestic sequoias. Camp tonight is a few more miles to the west on the south side of the Russian River at Casini Ranch. Day 6 is the day we eat our way down the Pacific Coast feasting on pastries, bread, cheese, oysters, and assorted other seafood. Start out your day with breakfast at the Cape Fear Cafe in Duncan’s Mills just 1 mile into the route. After breakfast, we head to the coast and travel down famous Pacific Coast Hwy 1 offering breathtaking views. An optional route up Bohemian Road takes you through the cute little town of Occidental past the famous Howard’s Café and into the Wild Flour Bakery in Freestone. Not to leave out the climbers, another optional route goes up Coleman Valley Road into Occidental the “Hard Way”. Routes come back together in Valley Ford which offers stores, shops and a deli that makes sandwiches to order. Next up is Tomales with another market and bakery. If you are still hungry after passing the great seafood at the Marshall Store or Tony’s you can fuel up at one of the many restaurants in Point Reyes Station before heading to camp 2 miles down the road. Day 7 is the last and shortest stage of the tour. We get one final 2000’ climb through the coastal forest that takes us up the hip of Mt Tamalpais with stunning 360 degree views along the fabled seven sisters. 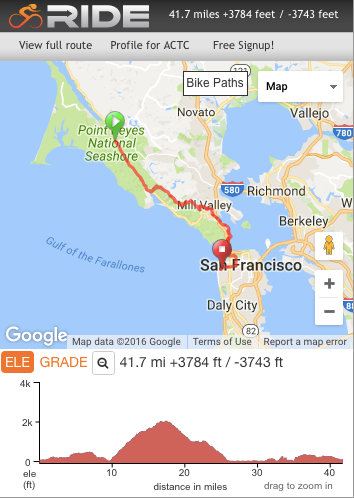 After a quick and beautiful descent on the other side into Mill Valley, we follow a local favorite bike path along the Bay into Sausalito where coffee and shopping await. We finish our tour crossing over the Golden Gate Bridge into the city of San Francisco, through the Presidio and into Golden Gate Park. Our destination is the Old Speedway where a celebratory lunch awaits. Have a safe journey back to your home and we hope we see you on the road again soon. If you have arranged to be picked up in San Francisco, Please read this important pick up information. If you have purchased post tour bus transportation during registration, you will be returned to the Fairfield Inn and Suites (where we started). If you have questions and/or comments regarding this website, please contact the Sierra to the Sea Webmaster. Copyright © 2019, Almaden Cycle Touring Club (ACTC), Inc. All rights reserved. ACTC is a not-for-profit organization based in San Jose, California.